this is simply GORGEOUS! ur hair is spectacular! LOVE IT! Hair and hearted dress are both absolutely adorable!!! You look great! Yeah that bow totally makes an adorable outfit. Es un vestido muy bonito ! Omg, you look absolutely adorable! LOVE the dress and love the high bun with the bow. Amazing. wonderful .. this dress is lovely!!! absolutly adorable! I loveeeee it!!! Goodness, that hair is cute! I've never seen a similar style. And the bow is such a sweet touch. I love how un-boring this look is. You certainly know how to make a simple black dress look delightful! You look like a modern day Audrey Hepburn!! 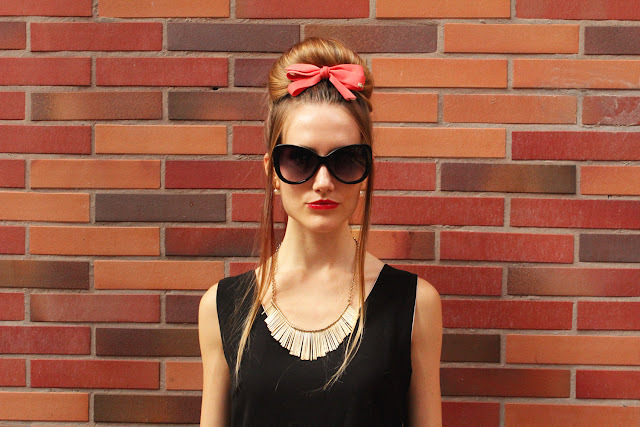 Beautiful hairstyle with the cute bow! Adorable! Loved this so much! I like HK star Aaron Kwok Fu-shing is a Hong Kong singer, dancer and actor.He is very handsome, cool and very nice person. Aaron Kwok Fu-shing have a lot kinds of sports cars.